Read the following case study and do the assignment. Once the top British name in rubber sole sport shoes, sneakers and trainers, today this 95-year-old family owned company is just one of many in a growing pool of competing brands. In UK market share, Browns trails behind Nike and Adidas, as well as Converse and Vans. The person given the task of restoring the company to its former glory is Michael Gordan, an ex-brand manager from Pepsico with an impressive track record. However, he is a newcomer to the sector and has not worked in fashion, sports or footwear before. We met him at the newly refurbished flagship store on London’s Oxford Street, where he presented the latest phase of a new marketing campaign which aims to emulate the successful resurgence of other British heritage brands like Burberry and Dr Martens. At the height of its success in the late 80’s, Browns was the number one trainer brand worn by everyone from sports stars to Madonna and Princess Diana. The design worn by Prince William, for his first school sports day in 1987, sold out in five countries in three days. Unexceptional these days, but let’s not forget there was no social media, no online shopping, just television and magazine coverage. However, the brand was a victim of its own success, failing to see the need to invest in new technology or advertising when people were queuing up to buy its products. Instead founders, the Brown family, ploughed profits into a series of disastrous investments including the Sinclair C5 and DeLorean cars. By the turn of the century they were quickly losing ground to big names like Nike and Adidas. By 2010 Browns was attacked from all sides. Supermarket own brands and branded products such as Dunlop and Lonsdale, sold through Sports Direct, took market share at the bottom end. At the top end, trainers hit the catwalks and designers such as Channel, Tom Ford and Céline began promoting sneakers for the first time at eye watering price points of around £600 a pair. 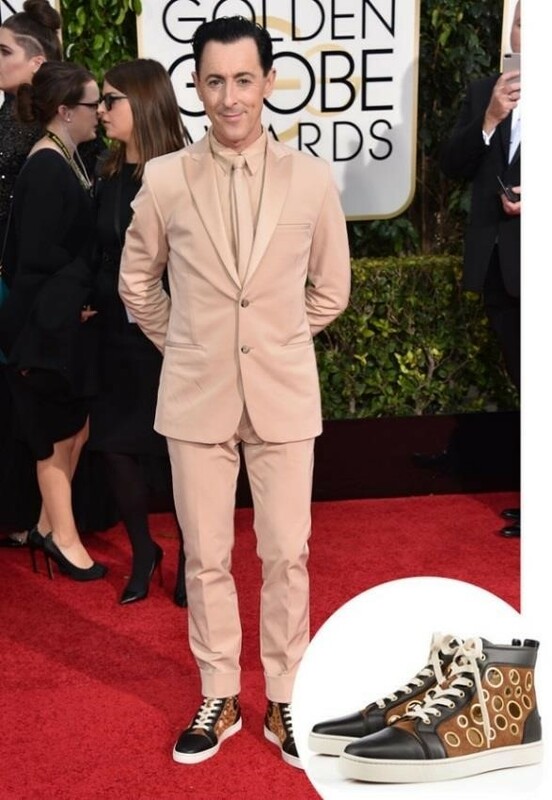 Stars on the Hollywood red carpets accessorised tuxedos with high end sneakers. In the mid-market, designer and sports collaborations with names like Raf Simons, Pharrell Williams and Michael Jordan helped to fuel growth at Nike and Adidas. At the same time suppliers of predominantly canvas based sneakers such as Converse, Vans and Toms increased in popularity, as well as trainers from brands like New Balance, Puma, Onitsuka Tiger, Superga, Skechers, LaCoste and Fred Perry. Timberlands, Uggs and Kickers for cold, have lost ground in recent years to sports trainers and fashion sneakers. Trainers have also encroached on traditional formal footwear, not just on the catwalk, but in classrooms where the line between sports shoe and formal school shoe has become increasingly blurred. Growing knowledge of the benefits of a healthy, active lifestyle are fuelling growth across the whole sportswear sector. This is supported by the UK Government through campaigns to promote sports and counter dramatic rises in obesity rates. Current legislation mandates sports as part of children’s education. Sports England, a nongovernment organisation (NGO), is charged with investing more than $1bn of national lottery and government funding, from 2012 to 2017, into initiatives to encourage community sports. However, there are still debates about whether the London 2012 Olympics has helped the sector. Post 2012, the participation rates in sports have fallen in all categories except athletics, cycling and gymnastics, with swimming recording the most significant decline. UK consumers are spending more on clothing and footwear as a % of total household expenditure. In 2010 clothing and footwear accounted for 5.4% of all household expenditure rising to 5.7% in 2014. Keynote estimates the UK sports footwear market has grown by 24% over 5 years, from £1.3bn in 2010 to £1.7bn in 2014. This reflects growth in functional performance sports footwear linked to health and fitness trends, as well as fashion trainers. Overall, the UK market is predicted to continue to grow over the next five years. Of the £1.7bn spent on sports footwear in 2014, an estimated 19% of the total (see table 1) was spent on running shoes and 35% on general use. When buying trainers, the typical amount spent across all adult age groups and across gender was £20 to £49, with only 0.1% of people spending £400 or more. People in lower social income groups were most likely to spend less than £20. Keynote estimates that in the last 12 months, 49.7% of UK adults aged 25-34 bought trainers. This was the highest purchase rate in any age category, reflecting active lifestyles and relatively high disposable income. In all age groups, from age 15 to 54, over 40% of adults surveyed had bought trainers in the last 12 months. This declines to 30% for ages 55 to 64, and only 16% of people over age 65 bought trainers in the last 12 months. The trend towards wearable technology and the success of the Nike Fuelband has begun to impact the footwear market with Nike MAG self-tying laces due for launch in 2015. Ethical concerns, particularly concerns about low wages and conditions in overseas manufacture, are also driving sales of ethical products, including nonleather based products and products manufactured in home countries. UK manufacture is seen as a sign of ethical production and quality by customers in the UK and overseas. Most sports shoes are still made from leather and suede and in the last five years, based on the availability of raw cattle hides, global leather costs have risen dramatically. This is due to both demand and supply effects with fashion and other markets using suede and leather extensively. There has also been a decline in cattle populations in the key supply countries, such as India and the US. Globally, trends around the world are broadly similar to the UK, with Nike the dominant global player. The top markets for sportswear are the US, China, Japan, Brazil and Europe. In emerging markets, the most noticeable is Indonesia which has seen growth in football participation but also in gym memberships. This is associated with rising disposable income and a growing enthusiasm for a healthy and active lifestyle. In a seemingly attractive and growing market, strong decline seems counter-intuitive and would challenge any new CEO. However, Gordan is bringing a passion for marketing, as well as a focus on operating efficiency, and the promise of new strategic direction to a company that has clearly lost its way. He has started by cutting costs, particularly at the over-staffed and bureaucratic head office. Gordan is still relying on the classic B logo that adorns the side of trainers (like the Nike swoosh, Adidas three stripes and New Balance N) and the famous gum soles with their union jack imprint. However, he is hoping to turn the company’s fortunes around and re-establish them as a top British brand. The strategy draws on the heritage of the brand and a current global fondness for all things quintessentially British. “Young people are starting to look back at the 80’s in the same way our generation look back at the sixties,” Gordan says, with a genuine sense of surprise. “Our second hand 80’s models are selling for higher prices on ebay than our new stock.” Gordan doesn’t want to raise prices significantly, “there is good growth in the mid-market and our average selling price of £57 is already above many of our rivals.” The market is also increasingly unisex. 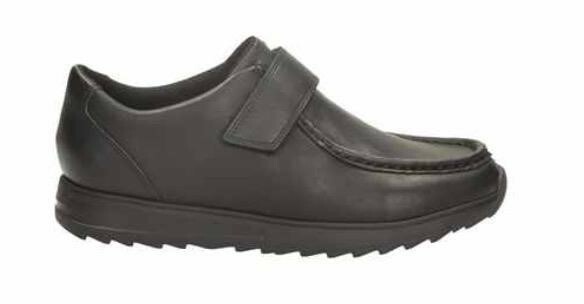 One of Gordan’s first moves was to introduce men’s shoes from UK size 5 (up from 6) as they are increasingly purchased by women, reflecting a fashion trend toward androgyny and unisex clothing. Despite the risk of being ‘stuck in the middle’ and outflanked by rivals on every side, he is sticking with the middle ground, maintaining a focus on the mainstream consumer but repositioning the brand as embodying a retro, British, 80’s heritage feel. Listening to Gordan, it is clear he loves the brand. As a former brand head of another mainstream brand, Pepsico, Gordan was key in helping the company fight off the challenge from rival CocaCola. Now Browns, a family-owned company, is hoping that Gordan can do the same for them. The company needs to recapture older people who bought their trainers in the 80’s and have now moved away, and attract a whole new generation who are currently queuing to buy rival products. Gordan was on vacation in China when he was first contacted by a recruitment consultancy about the role of CEO at Browns. “It was amazing,” he says. “I bought my first pair when I was 15 and I loved them and wore them until the tread was gone. I want other people to feel the same love for the brand that I do.” On his arrival, Browns only had two of their own stores left, one on Oxford Street and the original Northampton store. Remaining sales were through third-party retailers such as Foot Locker and Schuh. However, costs were still high with a large head office in Northampton and smaller sales satellites in the US and China. In his first few weeks at Browns, Gordan met with each of the top 40 employees. He asked, “what do you want me to change?” He was troubled by how poorly the company was doing but also that many executives did not seem to realise the scale of the problem, and few had any ideas about what to do next. There was a lack of creativity and innovation. Gordan responded by changing many of the top team. Within a year, over 20 of the 40 most senior employees were replaced. New hires include a new CFO (Chief Financial Officer) who cut nearly 20% out of operating costs whilst still retaining manufacture in the UK, and the same high quality product. With a better cost structure in place, Gordan was able to convince the Board to invest in IT infrastructure, particularly the company website. Gordan then began to focus on his key strength, brand building. He mentions companies like Burberry, Dr Martens and Converse that have gone through tough times but have been revived by drawing on their histories. For Browns that involves repositioning the company as the oldest British sports shoe manufacturer. A major marketing campaign titled, ‘As British as Browns’, is currently using celebrity endorsement, social media, and other mass media vehicles to entice customers back. At the moment, Gordan says, “we’re focusing on fashion.” “It’s incredibly difficult to compete with the likes of Adidas and Nike when it comes to performance or technology because of their massive spend on research and development. But we’ll start by getting cool again and build from there.” Gordan hired Alicia Ennis, former brand manager of Keds, to become the head brand manager and to manage the refocus. She is travelling the world, overseeing the rollout of major displays in sports stores, and at pop up shopping mall events, highlighting the company’s history and British heritage. A key aspect of the repositioning is the opening of new Browns stores, with five opening in the UK in 2015, and a modest programme of further rollouts scheduled for the US and globally in 2016 and 2017. The store layout, designed by Stella McCartney, is modern and welcoming. The design encompasses the brown of the famous B logo and the light beige of the gum coloured soles. The union jack, which is still imprinted on the trainer’s gum sole, is also imprinted on the wall panels. Gordan’s early work will translate into longer term success. This is a fictional case which draws on real world information. Data sources include Keynote Market Report 2015 Sports Clothing and Footwear. Your Individual Strategy assignment (e-portfolio 2) is a case study analysis of 1150 to 1500 words. You must analyse the Browns Sports Footwear case (case study is on weblearn and is 4 pages long) by applying appropriate strategy models from the core module text book, ‘Exploring Strategy’ (e.g. PESTEL, Five Forces, Strategic Grouping, Value Chain or Seven S, Porter’s generic strategies or Bowman’s strategy clock). You must summarise the strategic position of Browns using SWOT analysis and then make recommendations for the future direction of the company using your analysis and the Ansoff matrix. You should use tables or diagrams when you apply strategy models and populate them with data from the case. However, it is not sufficient to just apply models and produce diagrams or tables; you must discuss the key findings from each model (there are lots of marks available for the quality of your discussion). The information in tables or diagrams or in the end reference section will not be included in the word count. Your report should use full sentences and not bullet points (except in diagrams or tables). You should reference your work using the Harvard system and use relevant academic reading to develop and support your work (at least three different academic sources). You do not need to read beyond the case for information about Browns or the sports footwear industry. You should stick to the case and limit your reading to strategy text books and academic journal articles. You do not need to describe the models in detail e.g. you don’t need to explain what Porter means by ‘buyer power’; it will be clear from your analysis that you understand this. Reference section: in Harvard format. Only cite sources that are included in your assignment. There must be at least 3 different academic sources including the core text book. These should be cited in the main body as in-text references and in your end reference list. Wikipedia and BusinessBalls.com are not academic sources. · Demonstrates understanding of a wide range of strategy models and ability to appropriately apply them using the information from the case study. · Demonstrates understanding of the case study organisation and depth of insight and synthesis from the analysis of each model and analysis of the overall strategic position (synthesis of SWOT analysis). · Recommendations are based on the earlier analysis and demonstrate good understanding of Ansoff and the case. · Good evidence of academic reading. Good use of Harvard referencing. · Report is well structured and presented; arguments are coherent, logical and persuasive. Grant R (2012), Contemporary Strategy Analysis: concepts, techniques, applications Ed 8. Blackwell. Ireland, R., Hoskisson, R, and Hitt, M. (2012) The Management of Strategy: Concepts and Cases, 10th Ed. Johnson G, Scholes K and Whittington R (2012), Fundamentals of Strategy, Ed 2. Prentice Hall. Lynch R (2012) Strategic Management, 6th Edition, Prentice Hall. In the contemporary market, the operations of any business must conform to such factors as technology and innovation. The duo is the fundamental basis that, hitherto, determines the success rate of nearly every business activity. Since issues, like maintaining ethical standards and upholding originality of a product come to play in the running of an enterprise; exercising them, must kowtow to innovation and market trends in technology (Gillon and Pearson, 2017). However, with Michael Gordon’s idea to use McKinsey Seven S strategy and the SWOT analysis, the business is set to turn its fortunes around (Whittington and Scholes, 2013). The Seven S is a principle that operates on seven techniques which are interconnected to facilitate harmonious business operations (Egner, 2014). There are two categories of McKinsey’s Strategy, thus: hard and soft elements. The hard ones include strategy, structure, and systems. On the other hand, the other components entail factors which are intangible and those that cannot be seen by a naked eye. Such factors include skills, style, shared values, and staff (Todorov, 2014). To enable each employee to understand their role in the company, Gordon set up a hierarchy according to McKinsey’s structural recommendation (Gillon and Pearson, 2017). With the help of this chain of command, the company’s departments would easily share their functions and coordinate their activities with easy. Additionally, decentralizing the decision-making process to the heads of each department ensures that every leader is held responsible for any decision they make (Egner, 2014). The new structure, as compared to the old one, has a small hierarchy. The presence of bureaucratic ladder only server to lengthen the decision-making process and spreading responsibility. The matrix structure, on the contrary, restores accountability and fast implementation of a new change. High prices on goods, complacency, and reduced usage of the social media are the elements that led to the fall of Brown’s Sportswear from its leading position on the market. Restructuring of the business’ objectives to suit the customer needs helps a big deal (Egner, 2014). To begging with, lowering the prices of goods and rebranding the firm’s slogan from an outdated one to that which appeals to customers of the twenty-first century help to flaunt the sales (Gillon and Pearson, 2017). A business that embraces the use of computers can automate the financial recording process, online storage of the staffs’ information, and allocation and utilization of resources. Bureaucratic procedures such as timetabling, entering books of accounts, and computers efficiently do architectural plans: which are usually labor-intensive and time-consuming at the touch of a button (Egner, 2014). A company with employees plying from different walks of life operates on shared principles and values that enable it to surge forward and achieve a common goal (Todorov, 2014). The ultimate goal of a firm requires the collective efforts of its staff irrespective of the individual employees’ customs and norms. Gordon sets open-mindedness, innovation, consistency, dependability, and commitment to the course of the business activities as the company’s core values. In line with the technical nature of competitors in the market, innovation, and open-mindedness help a company to cope. When a company changes its strategies with the changing environmental pressure while upholding its core values, it does not only pose a stiff competition to its rivals but also sticks to its primary objectives. Secondly, workers are by law obliged to conduct the business activities in their best way possible while upholding decorum the dignity of the company. When Gordon takes office, he reshuffles the executive employees whose skills do not match his expectations and replaces them with more functional brains (Todorov, 2014). Gordon embraces a participative form of governance as opposed to an arbitrary type. In this case, departmental heads link with each other to discuss the way forward of the company by highlighting and correcting its flaws while suggesting the best way of improving their strengths. Besides, as can be seen with the employment of Alicia Ennis, Gordon prioritizes skills as opposed to long experiences. The executives at the former Browns boast of serving in the company for an extended period. However, they lack the necessary skills and knowledge to run a business with the current level of development in technology. It achieves this objective through training and empowering of works to take on challenges and risks that can help them to grow (Gillon and Pearson, 2017). Employees who occupy senior positions in an organization must act as such positions require of them. Otherwise, the posts would be literary vacant. In the case of having a malfunctioning staff, the CEO serves accordingly to save the situation before the matter gets out of hand. Gordon replaces the executives who lack visions with the ones with which, the enterprise can achieve its goals (Egner, 2014). At the begging, the company lacks researchers, technicians, and IT experts to survey the market, determine new trends, and use the social media efficiently for the good of the business. Gordon comes in with the idea of having a working IT department and skilled researchers that have seen the company start competing with NIKE and other companies in the market. The employment of new staffs also follows the procedural staffing process (Mintzberg et al., 2015). SWOT is an ellipsis for Strengths, Weaknesses, Opportunities, and Threats (Osterwalder and Pigneur, 2013). It is a representation of an organization’s ultimate strengths, weaknesses, opportunities, and threats. Strengths and weaknesses are always internal to a given business. On the other hand, opportunities and threats are external factors: the company has no powers over them (Freitag, 2015). We offer original products with our raw materials coming from the UK. It is a feature which is exceptional to us and different from our competitors. With the help of technology, we boast of offering a spot on services to our clients. The nature of services and commodities we provide help us to retain relatively vast numbers of clients compared to our competitors (Seth, 2015). We have been on the market forever. The experience we have, as our clients can attest, makes us competent in what we produce. Secondly, our one-on-one interaction with the patients is a distinctive feature that has seen us this far (Seth, 2015). Our services and the knowledge of existence are wide-spread. However, it cannot go without saying that, some parts of the world do not only benefit from our services, but they also have no idea about our existence. Lack of using the current technology for a long time affects us (Pahl and Richter, 2017). According to the quality of our products, the costs of our goods and services are slightly higher than that of our rivals. Given this, some clients would instead go for cheaper products than high quality. When Gordon takes the position of the CEO, the company is not unleashing any change in technological advancement in the market. We are grasping available opportunities and initiating all the necessary treatment they deserve to realize maximum output. We endeavor to penetrate a broad market to expose our products and services to customers worldwide. However, this requires an enormous investment of capital which impedes its realization. We deal in products of high qualities. Unlike our competitors, it is not easy for us to lower our prices on products owing to the amount of capital we invest in our products. Technological changes can take place overnight. Such changes may bring along adverse effects that can shape the customers’ choices of a product in a wrong way. The Browns face stiff competition from both existing and upcoming companies that command enormous online followers. As such, the firm has a lot of pressure to cope which may drive its operations overboard. In a nutshell, businesses, especially in the fashion industry, thrive handy with the social media. By keeping track changing trends in the market and applying the necessary corrections, a business can out-compete its rivals like forever (Mintzberg et al., 2015). Secondly, maintaining an innovative and open-minded staff helps a company to know the changes other firms dealing in similar products make. Thus, prevents the enterprise from staying in the dark in matters technology. Businesses which venture in fashion and style need to have an established and working technology with necessary equipment and technicians to enable it to compete favorably with others on the market. The trends which run online determine competition in fashion and design. Thus, venturing into this business requires one to have a specialized team that can actively manage online marketing and advertisement. 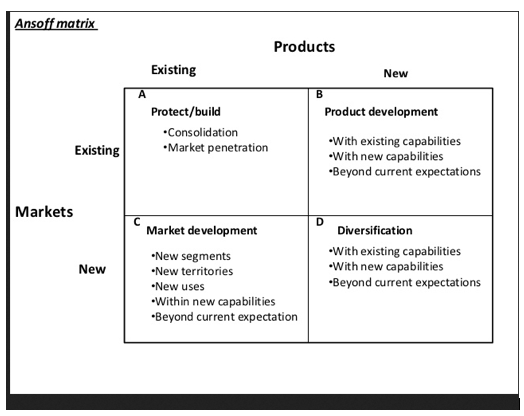 Ansoff matrix recommends upgrading products to meet the market standards and customers’ demand (Yu, 2017). The production of shoes from pure leather is an eye-catching business that does not only attract clients but, in itself, helps to sustain the existing ones. Running this kind of activity while conforming to the changes in demand and stands of the goods can keep one’s business on top of the market forever (Bachmeier, 2013). However, the need to expand and diversify a fashion and design business has to obey the rules of Ansoff matrix (Bachmeier, 2013). When the products exceed the market demand, they become surplus goods. On the other hand, when the need for products exceeds their supply, they form a deficit; none of the two situations favors a business on a competitive market. Thus, for there to be a balance between the supply and demand, companies need to have a thorough study and understanding of their customers (Yu, 2017). Bachmeier, K. (2013). Analysis of marketing strategies used by pepsico based on ansoff’s theory. [Place of publication not identified]: Grin Verlag. Egner, T. (2014). Mckinsey seven s model. [S.l]: GRIN Verlag GmbH. Freitag, A. (2015). Applying Business Capabilities in a Corporate Buyer M & A Process. Wiesbaden: Springer Fachmedien Wiesbaden. Gillon, J. and Pearson, L. (2017). Developing strategies for international business. Houndmills, Basingstoke, Hampshire: Palgrave Macmillan. Mintzberg, H., Lampel, J., Quinn, J. and Ghoshal, S. (2015). The strategy process. Upper Saddle River, NJ: Prentice Hall. Osterwalder, A. and Pigneur, Y. (2013). Business model generation. Hoboken, N.J.: Wiley. Pahl, N. and Richter, A. (2017). SWOT Analysis – Idea, Methodology And A Practical Approach. München: GRIN Verlag GmbH. Seth, C. (2015). Swot analysis. Namur: 50minutes. Todorov, K. (2014). Handbook of Research on Strategic Management in Small and Medium Enterprises. New Yok: IGI Global. Yu, S. (2017). Art Of Modern Oriental Management. Singapore: World Scientific Publishing Company.